Invisalign's clear, custom made orthodontic aligners allow patients to straighten their teeth without the hassle and discomfort of traditional metal braces. Not everyone had the opportunity or desire for braces when they were young. It is never too late to improve the appearance and function of your smile! At Guildford Smiles Dentistry, we offer orthodontics for adults looking to improve the aesthetics or function of their smiles. Orthodontics is often about more than appearance. We can correct your bite and provide you with a treatment plan that offers greater function, reduced sensitivity, and reduced jaw pain. Properly aligned teeth can give you a happy, healthy smile that is easier to keep clean and helps you avoid decay due to overlapping or overcrowded teeth. We can also address any cosmetic concerns you have and provide treatment plans that meet your goals. With traditional orthodontics, we will attach brackets and guide your teeth into proper alignment using wires that we periodically adjust. Over time, your teeth will achieve their ideal alignment. Treatment time and cost depends upon the treatment you require for a healthy smile. If you feel that traditional orthodontics do not fit into your lifestyle and you prefer a more discreet way to move your teeth, we offer orthodontics using clear aligner trays such as those used in Invisalign and Clear Correct. We will supply you with a series of aligner trays that you will change out approximately every two weeks. Because they are removable, keeping your teeth clean is easy! Your clear, plastic aligner trays are nearly invisible, so you can wear them without affecting the appearance of your smile. For the best results, we recommend wearing your clear orthodontic trays at least 22 hours per day, only removing them to eat, drink hot beverages, and to clean your teeth. We will schedule periodic exams to monitor your progress so you stay on track! Treatment time and cost is similar to traditional orthodontics. We can outline the specific details of your treatment after you have an appointment with your dentist. 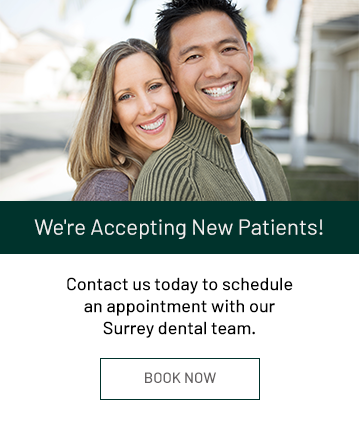 If you are an older teen or adult wishing to improve the alignment of your teeth, contact our Surrey, BC office to schedule an orthodontic evaluation with Asmaa Seddik, BDS. We look forward to helping you achieve the healthy, beautiful smile of your dreams. After your orthodontic treatment is complete, we will provide you with a retainer to wear to hold your new smile in place. Faithful dedication to wearing your retainer is essential to maintaining the position of your teeth. Without proper retainer use, your teeth will begin to drift in a condition called orthodontic relapse.